This fall, Oregon State University launched an exciting new pilot program to develop stronger relationships between faculty and students, with the overarching goal of improving student retention and graduation rates. The College of Science played a lead role in developing the program. Currently, the Faculty-Student Mentor program is only being tested on a sample of underrepresented minority students, first generation and Pell-eligible students who are in their first year at OSU (both traditional and transfer students. However, OSU is hopeful that these two preliminary years will see the success required to expand the program to the entire university. There is reason to be optimistic; data from other universities show faculty-student mentor programs can reduce dropout rates by as much as half. OSU currently has a first-year retention rate of about five percent lower than its goal of 90 percent retention. This rate is even lower for Pell-eligible, first-generation and underrepresented students. While an OSU study showed many undergraduates feel isolated from faculty, nearly 96 percent of students say they have at least one professor who makes them excited to learn. Therefore, the urgent need is to facilitate access and foster substantive faculty-student relationships to enhance student engagement and increase retention and graduation rates. In order to help the university do a better job in supporting students in their first year at OSU, the pilot program will focus on establishing a relationship between mentors and students rather than advising or conveying discipline-specific knowledge. This approach will help mentors place special focus on issues of student transition and adjustment to college life. Students selected for OSU’s Faculty-Student Mentor program are put in groups consisting of five students, a peer mentor who is a junior or a senior, and a faculty member. Students will meet with their mentors for one hour every other week during fall, winter and spring terms throughout their first year at OSU. The new mentoring program is supported by several senior professors and upper-level administrators. The program is led by College of Science Dean Roy Haggerty and Dan Larson, interim vice provost for student affairs. In addition to Dean Haggerty, faculty volunteers for the program include College of Science Associate Deans Henri Jansen, Doug Keszler, Matt Andrews; Math Department Head Bill Bogley; statistics professor Alix Gitelman; Microbiology Department Head Jerri Bartholomew; Provost Ed Feser, Senior Vice Provost for Faculty Affairs Susan Capalbo and other university leaders and faculty. Strategies to improve student retention are particularly relevant in STEM fields. From universities all across the United States, studies indicate that fewer than half students who start out in these programs succeed in graduating with a degree in the field. This rate is considerably higher for students from underrepresented groups, with only a quarter of those who enrolled receiving a STEM degree. Studies dating back to the 1990s have hypothesized that the lack of positive mentorship is often a significant factor in this disparity of graduation rates. Many first-generation and underrepresented students struggle to find their feet in a field that no one in their personal life has even encouraged, let alone shown them it’s possible. For some of these students, the greatest benefit of a mentor program is the positive role models it provides, helping students form a stronger self-identity as scholars, and realize their full potential for success in challenging fields at the university. 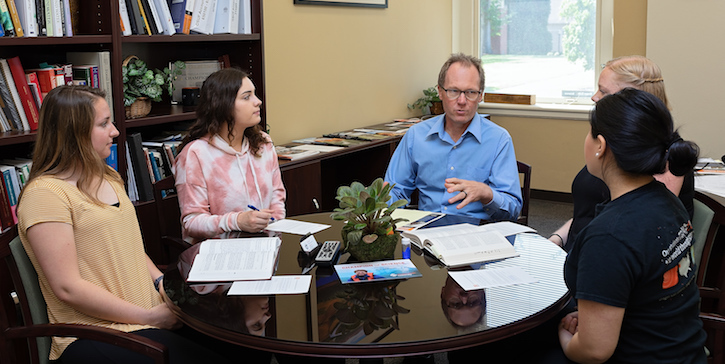 The Faculty-Student Mentor Program is part of OSU’s Student Success Initiative whose mission is to bolster student success through expanded student support services and changes in learning models.